The story that I tell here is, I know, a one-sided tale. It is also the source of pending litigation. A friend of a parent of the child reached out to me to ask me to share the story with the genetics community with the hope that some good could come out of a terrible experience, and did so with the approval of the parent’s lawyers. I obtained the details from publicly available records. I am not passing judgment on who was right, who was wrong, who did what, and who didn’t do what; the lawsuit will rule on that. I have had no involvement with the care of the patient or the subsequent legal wrangling, nor do I have any particular expertise about the disorder in question. For months I have struggled with whether the DNA Exchange is the appropriate venue for this, but ultimately decided that the family’s voice needs to be heard. I have largely anonymized the story because, really, specific names and diseases do not matter. What matters is that steps need to be taken to help ensure that other patients, families, providers, and laboratories do not repeat this sad tale. The child was born about a decade ago, the product of an uncomplicated, happy, and desired pregnancy. At a few months of age, the child developed seizures after receiving a routine vaccination and went on to experience ongoing seizures of differing types. Various diagnoses were entertained particularly mitochondrial diseases and treatment included standard anti-seizure medications. A number of specialists were involved with the child’s care, including geneticists. Early on in the work-up genetic testing identified a mutation in a gene linked to a disorder that would explain the child’s seizures, a finding which the lab interpreted as a variant of unknown significance (VUS). Based on available literature at the time, there was some reason to believe that the variant might be a pathogenic mutation – it had been reported in affected patients – but determining the clinical significance of a gene mutation is a problem that continues to plague genetic testing today. Now here is where the story gets complicated and fuzzy, and to me where the tragedy starts to unfold. Apparently, the physician who ordered the test decided that the genetic test result was inadequate to help establish a definitive diagnosis, and pursued other diagnostic possibilities. As far as can be gleaned from the records, the genetic test results were not shared with the family although some of the treating physicians had considered the diagnosis on clinical grounds. The child continued to be treated with medications that, unfortunately, worsen the seizures for the condition that the child was ultimately diagnosed with – a condition caused by mutations in the gene in which the VUS was found. Sadly, the child died a few months shy of 3 years old from intractable seizures likely related to the contraindicated seizure medications. The family did not find out about the genetic test results until about 7 years after the child died and only then after a parent requested the results. A few months later, the lab produced a revised report that reclassified the variant as a disease-associated mutation. Curiously, the report does not contain a revision date nor does it include the reasoning or data that led to the revised interpretation. 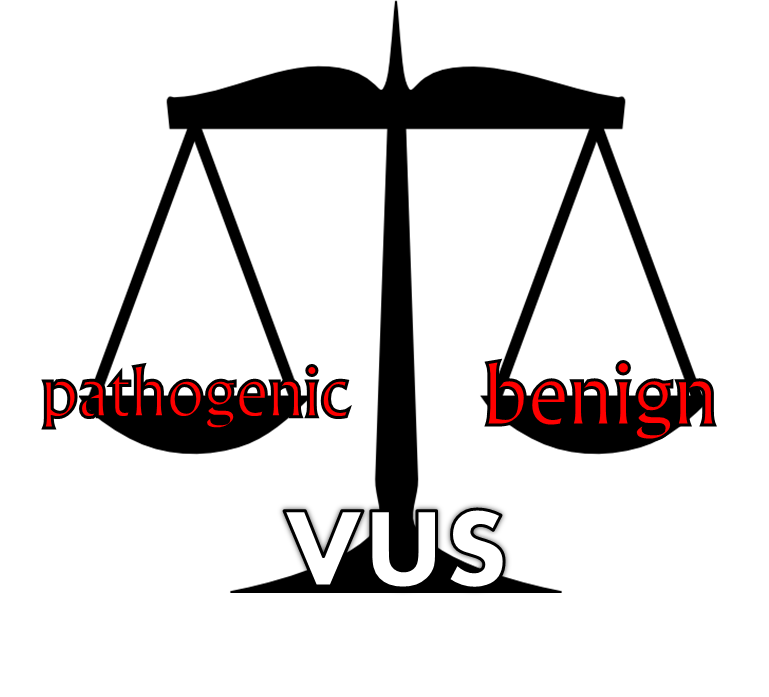 On one level, this story tells the genetics community nothing it did not already know – interpreting the clinical significance of a VUS is a terribly complicated and at times subjective affair. There is no single gold standard that can be used to determine clinical significance, which involves complex statistical, genetic, and biological analysis. Two equally capable labs can look at the same set of data and come up with diametrically opposite conclusions. Articles address the frequency of variants in genetic testing and differences in interpretation, along with providing an idea of the scope of the problem. But statistics are not stories. Stories convey the human impact of statistics and the urgency of the problem. As the saying goes, one death is a tragedy; a million deaths is a statistic (attributed to, of all people, Joseph Stalin). Public databases such as ClinVar are starting to address this problem but they are still in their infancy. Indeed, a recent check of ClinVar revealed only one entry for the variant in question and the entry doesn’t even classify the variant. As human genome testing is ordered at exponentially increasing rates, the need for a uniform approach to genetic test interpretation and data-sharing is beyond pressingly critical. Restrictive gene patents and data hoarding may be good for business but they are not good for patient care. Lots of money will be made through genetic testing; some portion of those profits need to be channeled to funding well-curated freely available databases ( a database that is not well-curated is useless, and potentially harmful). Perhaps there could be tax breaks for labs that share data and government funding could favor research projects utilizing labs that share variant data. But this story highlights other potential weaknesses in the genetic testing process. Parents and patients need to have pre-test genetic counseling so they are clearly informed when genetic testing is ordered. Results need to be explained to patients, even if they are uncertain. This is no mean feat, especially when a patient is going through an extensive work-up and many tests of all varieties are being ordered. Results have to be clearly available in medical records so all providers can have ready access to them, and patients should always have a copy of their test report made available to them along with an explanatory letter. A letter to the family summarizing the results could have prevented a lot of anguish for this family. There must be good mechanisms in place to regularly update test interpretations and for those updated interpretations to be communicated clearly and without delay to providers and patients. Patients should be encouraged to actively participate in seeking more information about their genetic test results and to enroll in centralized databases such as PROMPT. Maybe labs should allow a random sample of their report interpretations to be audited by an unbiased third party such as the College of American Pathologists to assure adherence to test interpretation guidelines. This could be a voluntary program but labs may be eager to participate as a selling point of their commitment to accuracy. Governments and insurers must allot the funds and resources for all this to take place. The outcome here was the worst possible for everybody – most especially the patient and the patient’s family, but also no lab and no care provider ever wants something like this to happen to a patient. It haunts us all. If any good can come out of this, then this story will inspire us to work with greater urgency and cooperation to create workable solutions. Our patients deserve no less than the very best. This posting is dedicated to the memory of the child whose all-too-short life is discussed here.